If there’s one thing we’ve learned from this offseason, it’s this: Keeping football in its proper perspective is a struggle in this country. It’s more than a struggle, actually. I’d argue it’s an epidemic. There was the “Bountygate” scandal with the New Orleans Saints, where in-game performance and money became more important than the NFL’s rules. Commissioner Roger Goodell responded with one of the most severe punishments in NFL history, suspending Sean Payton for an entire season, saying that the Saints’ actions threatened the health and welfare of players. I could act like I’m riding a high horse, er, a colt, and condemn New Orleans and Penn State because, one, it’s easy to do and, two, everyone is doing it. But the truth is that we all lose perspective. New Orleans was so focused on winning that they broke the rules. Penn State was so focused on their pride, perhaps, that they kept secrets. Perspective gets out of whack when virtues are compromised. Perspective gets out whack when something replaces God. 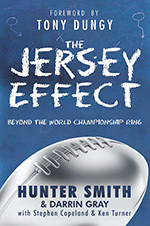 As I mention in “The Jersey Effect,” it’s not about making football less important. It’s about making God most important. The institutions of this world are a revolving door that will never satisfy our hungry and desperate souls. The only thing that satisfies–that quenches–is an intimate relationship with God. Until then, our worldly perspectives centered around winning and pride will lead us toward destruction.